This is Justin Masterson, the Cleveland Indians' opening day pitcher, being controlled by Richie Martinez, aka TeRRoRR of Major League Gaming, and the captain of Legacy, the pro Gears of War 2 team. 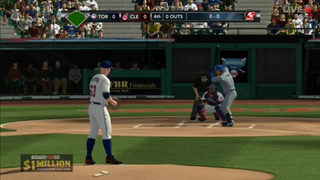 Right now, he's trying his hand at the million dollar prize in 2K Sports' perfect game challenge for Major League Baseball 2K12, which got under way yesterday. TeRRoRR has been quiet for the past couple of innings as he tries to throw a perfect game with Justin Masterson of the Cleveland Indians against the Toronto Blue Jays, but I'm told he's thrown some epic ragequits when a hitter breaks up his perfecto. He may also know he's being watched in huge numbers, because he isn't as chatty as he was earlier in the day, when I'd hear him call out scouting information on opposing batters. Clearly, TeRRoRR has done his homework.